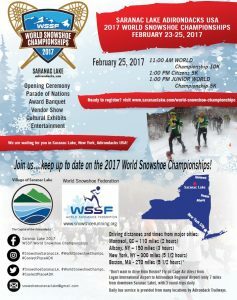 WORLD SNOWSHOE CHAMPIONSHIPS IN SARANAC LAKE NY THIS WEEKEND! Tons more info here on Facebook and at the race web site. Sunshine and warm (for February) weather greeted 54 snowshoers at the Wilton Wildlife Preserve Camp Saratoga Parcel on Saturday morning, 2/18. Another surprise for many who’d been there before – a brand new building with men’s and women’s restrooms complete with heat and running water, thanks to a major investment on the part of the Town of Wilton. The race moved back to its traditional start up the trail from the HQ cabin, which provided a gentle downhill introduction to the course and the many hills, some smaller and some larger, that followed. While there was plenty of snow, the consistency varied – the wide groomed XC ski trails tended to be pretty hard-packed, while the less-used singletrack was a little softer. Any spot in the sunshine tended to have the consistency of mashed potatoes and an annoying tendency to build up temporary snowballs in snowshoe cleats. J Matthew Medeiros and Megan Boyak won the mens’ & womens’ races, respectively. Full results can be found here. A huge THANK YOU goes out to RD Laura Clark and the Saratoga Stryders who spent many hours making this race happen, including marking and double-checking the course multiple times this week – and then running in the the race today to boot! Another Double-Header Weekend – With Snow! Saturday we have the Camp Saratoga 8k at the Wilton Wildlife Preserve in Wilton, NY. The race starts at 10:30 AM, with registration/check-in from 9:15-10:15. Overflow parking is a bit of a walk so leave enough time to get to registration after you’ve parked your car. The course is rolling with a couple of short but steep hills. At least we don’t have to worry about the yellowjackets! More information including map links for directions can be found here. Day-of registration is $20; download and complete the registration form to save time on race day. Sunday is Brave the Blizzard at Tawasentha Park in Guilderland, NY, with two distance options, 5k and 5.5mi. The race starts at 10 AM, with registration/check-in starting at 9 AM. Day-of registration is $20 (5k) or $25 (5.5mi). The 5k features hills, woods, and a lap around the perimeter of the adjacent golf course; the 5.5miler splits off from the 5k just before the finish and adds an additional loop into the woods and fields across Normanskill Creek. Since the ARE is doing 5k splits for the longer race, we will offer points for both distances for the 5.5 mile runners ie. you’re getting two races for the price of one, points-wise. The big attraction for many will be the plentiful pancakes after the race. More info including directions to the start and a course map can be found here. There are also quite a few non-series races on Saturday, including two which feature fat bike races as well as snowshoeing. Check out our non-series race page for more information. And a final heads-up, after this weekend we take a week off from series races so that anyone who wants to can attend the World Snowshoe Championships in Saranac Lake, NY, on Feb 24-26. Registration prices for the Championship races increase this Sunday, 2/19. The vehicles in the parking lot at Prospect Mountain Nordic in Woodford VT were conspicuously sparse prior to Sunday’s Switchback Singletrack 3.3mi snowshoe race – of course, the morning snow storm (with a forecast of heavier snow in the afternoon) may have had something to do with that. 15 stalwart lunatics snowshoe racers braved the elements to run, stumble, and stagger through ever deepening snow as they climbed through the woods and then climbed even more before making a rapid descent back to the start area. The descent was made a bit more challenging by being mostly into the wind, which whipped icy snow pellets at everyone to add to their overall experience. While RD Tim Van Orden started the race, part of the way through the course he took a shortcut to the finish so that he could be sure of getting correct times for the front runners, since he was also timing the race. This left the lead to Jeremy Drowne for the men and Jamie Woolsey for the women, on a course that was likely the most difficult encountered so far in the 2016-17 series. Tim originally indicated that this might be the course for the Northeast Championships in March, but today he also talked about having separate 4k and 6k segments – so we’ll have to wait and see what he comes up with for March 12. One thing we can count on is that it will provide plenty of challenge to both the front runners and those at the back of the pack.